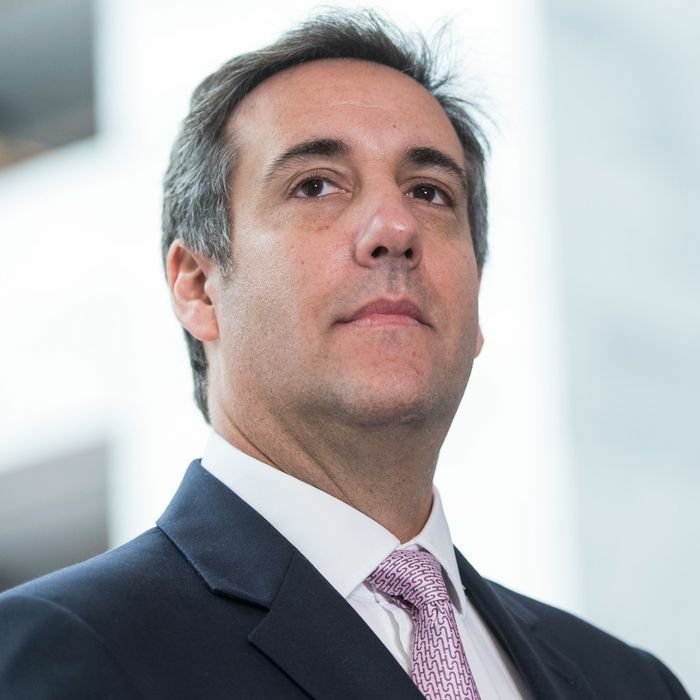 Trump attorney Michael Cohen Photo: Tom Williams/CQ-Roll Call,Inc. A month ago, the Washington Post reported that Robert Mueller has sought documents and interviewed witnesses about incidents involving Donald Trump’s personal attorney, Michael Cohen. Now, the FBI has raided Cohen’s office, residence, and hotel room and seized documents, according to the New York Times, CBS, and The Wall Street Journal. Bloomberg News reports that Robert Mueller received approval for the raid from Deputy Attorney General Rod Rosenstein, who directed that it be carried out by the U.S. Attorney for the Southern District of New York. Cohen is clearly in a lot of trouble. This is not a case of a highly respected pillar of the community being suddenly revealed to have a dark side. Perhaps the most surprising thing about Cohen’s career is that up to this point he has avoided prison. Cohen is fond of threatening people that Trump needs to intimidate; the subjects of his threats include journalists who report unflattering things about Trump. Cohen has been involved in Trump’s murky business dealings with Russia, along with his childhood friend, legitimate businessman Felix Sater, who once stabbed a guy and was also convicted of a mob-linked pump-and-dump scheme. Perhaps more pertinently, Cohen facilitated hush payments to women who had sexual encounters with Trump. At the very minimum, he seems to have committed a clear campaign-finance violation by making a payment to Stormy Daniels in October 2016 that was intended to help Trump’s campaign and that exceeded campaign-finance law. Somebody also sent a person to threaten Daniels to keep quiet, and given Cohen’s handling of the matter, he would be a prime suspect for having arranged the threat, or at least having knowledge of it. Trump has operated his career around the margins of legality. Cohen is the sort of attorney you cultivate to represent you in these kinds of matters. Of course, the logic of having a Michael Cohen defend you does begin to deteriorate right about the time FBI agents show up at his home and office with search warrants. Update: The Washington Post reports Cohen is being investigated for bank fraud and campaign finance violations. It is not clear if those are the only alleged crimes that are being investigated. Second update: The Post’s updated report adds wire fraud to the alleged crimes being investigated. The New York Times states, “The payments to the pornographic film actress, Stephanie Clifford, who is known as Stormy Daniels, are only one of many topics being investigated, according to a person briefed on the search.” Cohen is, indeed, facing a high level of legal risk.